We have several unrelated clutches of Flap-Neck Chameleons for sale. Flap Neck Chameleons are one of the most common chameleons in all of Africas spanning several countries throughout the continent. 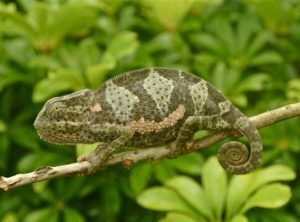 Flap Neck Chameleons have similar care to that of a Veiled Chameleon. 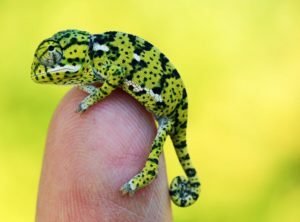 As babies flap neck chameleons are bright yellow with dots all over their bodies. When excited Flap Necks have small flaps behind their heads that flare up like small elephant ears. Flap Necks are a very hardy chameleon species and would be a fine starter chameleon. Read our Veiled Chameleon Care Sheet for the proper way to maintain your Flap Neck Chameleon.